The pain from losing your best friend is very real to me. Not only did I lose my best friend Madeleine thirteen years ago, but five months later Lynn, another close friend, died from cancer. I’ve spent years absorbing the reality of life without a treasured sister of the heart at my side. As hard as the grief is from losing my lifelong friend, the pain of her loss is offset by the joy I had over the 40 years we were friends. I wouldn’t trade that for anything. It’s hard for me to imagine going through life without a best friend. I’ve always gravitated to that one special female friend. At age 6 it was Carol. At 12 it was Elyse. At 18 it was Madeleine. She, of course, has turned out to be my last best friend since I know there will never be a replacement for her. I don’t know why some women seek a close connection with another female and others don’t. Is there something in our makeup that leads us to bond tightly with a female friend? Or perhaps we’re just lucky that another woman turns up in our life with which we can be ourselves, share our innermost thoughts and receive wise counsel and unconditional love in return. What’s been your experience? Have you been a one-best-friend kind of woman? If so, why do you think that’s the case? And, if not, why not? i have always had that special one best friend. when i was little say 4-7 it was my neighbor patrick. when i was 10 it was carol, i am still friends with her. then when i was 17 it was joleen and she was my very best friend till the day she was killed on august 14 2013, the day my life as i knew it would never be the same. we were friends for over 30 years. we were close i was closer to her than my real sister. we spent so much time together. she spent many a holidays with me and my family. it was like for years when we were single we were a couple. we did EVERYTHING together. we had a small group of girls (5) that for years always hung and me and joleen were the only best friend couple in the group. when joleen died we all kind of died. it’s just not the same. as we got older and started to go our separate ways joleen was the one that kept us together. we try now but there is just this profound sadness. it is just not the same but i am so glad i have so many memories in my head and heart of my time with this awesome woman that i was so lucky to have known. i have so many pictures of all our adventures in life — good and bad. i love her so much and my heart aches everyday for her. i charged up one of my old cell phones and i have so many voice mails from her on there that i listen to when i need to hear her voice and hear her call me kelly belly (everyone else always called me kellygirl). i am so blessed to have had the opportunity to have the relationship i did with this girl. i love you joleen with every fiber of my being. Thanks for your thoughts about being a one-woman friend and for your memories of Joleen. 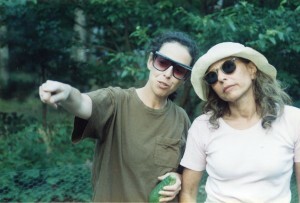 For anyone who’d like to read more about their friendship and see a photo of the two of them together, go to http://friendshipdialogues.com/friendship/story-kelly-meyer-friend-joleen/.